Cast Technologies is a family-owned-and-operated foundry and machine shop that got its start 120 years ago making brass plumbing products. Today, the Peoria, Ill., company primarily machines aluminum and brass diesel engine, transmission and earth-moving components such as air-intake elbows, turbos, bearing carriers, oil pans and housings for a wide variety of industries, including construction and agricultural equipment. The company incorporated mixed part-type automation into its machining process by installing a Makino Machining Complex (MMC2) pallet handling system with three a61 horizontal machining centers. The Makino Machining Complex (MMC2) does the work of six stand-alone HMCs, enabling Cast Technologies to reduce labor by 33 percent and redeploy four of its operators into more value-added positions in other areas of the shop floor. The elimination of setup times and efficiencies gained from reduced part load/unload and tool changeover times have given Cast Technologies a 25 to 30 percent improvement in spindle utilization rates. Improved tool capacity and scheduling capabilities enable the company to run smaller batch sizes with over 100 different parts types through the cell. 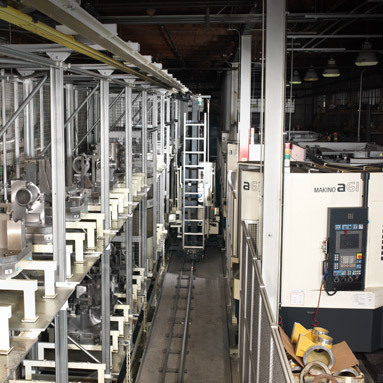 The Makino Machining Complex has also reduced work in progress (WIP) and scrap and has led to the company accomplishing just-in-time (JIT) part delivery, letting Cast Technologies respond more rapidly to customers’ changing needs at any time of day.